This a NEW special edition for is all who love the “Luck” of the Leprechaun. 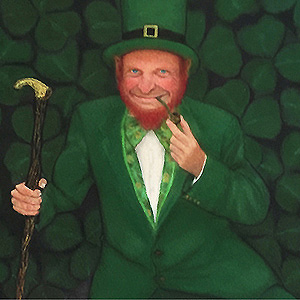 Your Fine Art “Lucky Leprechaun” Re-creation of the Original Pastel Painting is fun piece of art that will make you smile. The “Lucky Leprechaun” is out there all the time tempting you with his dance-like pose, mischievous smile, and pot of Gold! If you look hard you might even find a four leaf clover! Blow him a kiss for Good Luck and Fortune! Do you believe in Leprechauns? 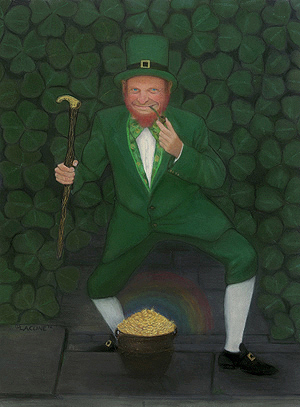 Re-creation of the original pastel painting that is a special series at a special price for Leprechaun lovers. The Fine Art Print has a 1/4″ border for the framing and is sent to you mounted on acid-free foam ready to frame. It is also embellished with pastel and sprayed. When you frame use spacers to protect the painting from touching the glass and only use ARA Museum Glass for great viewing. Each piece comes with a Certificate of Authenticity. There is Free Shipping in the USA. May the Luck of the Leprechauns be with you! If you would like any more information email me directly.